From free and open-source software, Creative Commons licenses, Wikipedia, remix music and video mashups, peer production, open science, open education, and open business, the world of digital media has spawned a new “sharing economy” that increasingly competes with entrenched media giants. Reporting from the heart of this “free culture” movement, journalist and activist David Bollier provides the first comprehensive history of the attempt by a global brigade of techies, lawyers, artists, musicians, scientists, businesspeople, innovators, and geeks of all stripes to create a digital republic committed to freedom and innovation. 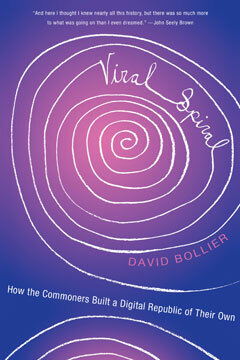 Viral Spiral—the term Bollier coins to describe the almost magical process by which Internet users can come together to build online commons and tools—brilliantly interweaves the disparate strands of this eclectic movement. The story describes major technological developments and pivotal legal struggles, as well as fascinating profiles of hacker Richard Stallman, copyright scholar Lawrence Lessig, and other colorful figures. A milestone in reporting on the Internet by one of our leading media critics, Viral Spiral is for anyone seeking to take the full measure of the new digital era.